It’s finally summer, so it’s time once again for the best breakfast ever…Healthy Fruit Smoothies. The great thing about the following technique is that you can substitute just about any fruits and juices that you like…it’s all good. For this Hawaiian smoothie, I took fresh picked papayas and bananas, cut them into chunks and froze them overnight. 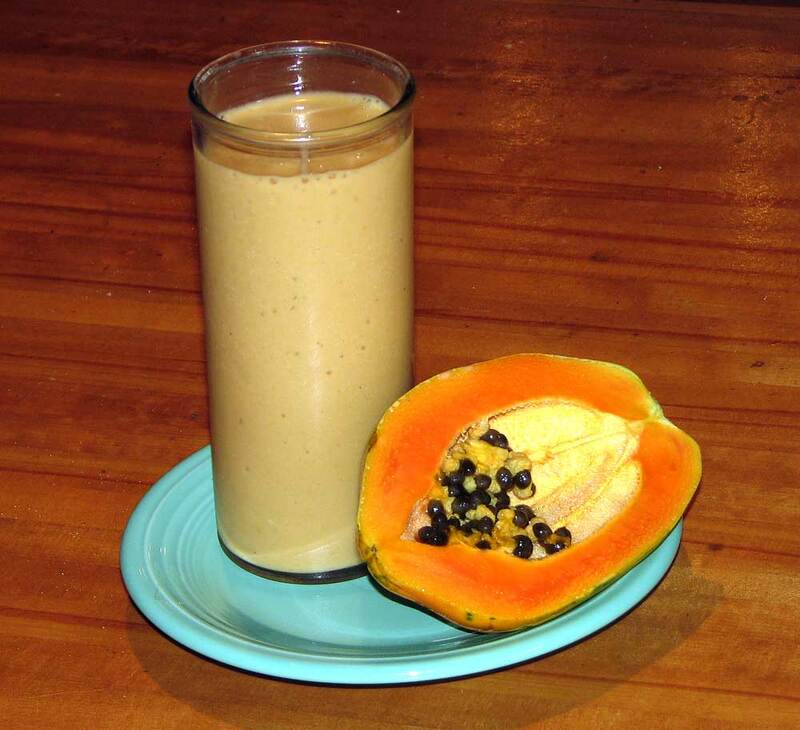 To make the smoothie, put about a cup of frozen papaya chunks, a cup of frozen banana pieces, 6 oz. of your favorite blueberry yogurt (I use Dannon) into a blender and add about 3/4 cup of V8 Splash (available everywhere…I use Tropical Blend, but any flavor you prefer will do). Pulse the blender for about 30 seconds, and if necessary, give it a quick stir (make sure the blades have stopped! ), and repeat a few times. If it appears too thick at this point you can take the top off the blender while it’s running (make sure all the fruit has been pureed before you do this or you may end up wearing some smoothie) and slowly pour in a little more Splash until you see a vortex begin to form in the center-you’ll know what I mean when you see it happen-and the Smoothie will have a perfect consistency. If you love peanut butter like I do, you can add a heaping tablespoon (I prefer chunky) and blend for a couple of seconds more…it’s incredible! For convenience, you can buy bags of chunked frozen fruit just about anywhere. I love the Costco brand..it has peaches, strawberries, pineapple and honeydew and comes in a 6 lb. bag. The secret, though, to a really great smoothie is the frozen bananas (I always keep a baggie full of frozen banana chunks in the freezer)…that’s what gives it the amazingly creamy consistency.